PLEASE NOTE: DOOM’s representative’s have asked me to remove the album, and out of respect for the Mask, of course I complied. I want people to hear this project, because DOOM is my hero, but only a fool purposely crosses the Villain. Hope you heard it while you could! 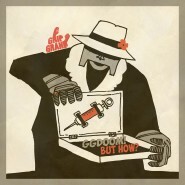 UPDATE: Top secret agents of DOOM have made the album available again, for free, HERE via his Facebook page (www.facebook.com/mfdoom) and Rappcats.com…all hail DOOM!